Onetime Auschwitz Guard Arrested In Philadelphia On German Warrant : The Two-Way Johann Breyer, who immigrated to the U.S. in 1952, is being sought by German authorities in connection with the deaths of 216,000 Jews at the Auschwitz-Birkenau death camp during World War II. The Nazi concentration camp Auschwitz I in Poland, circa 1945. 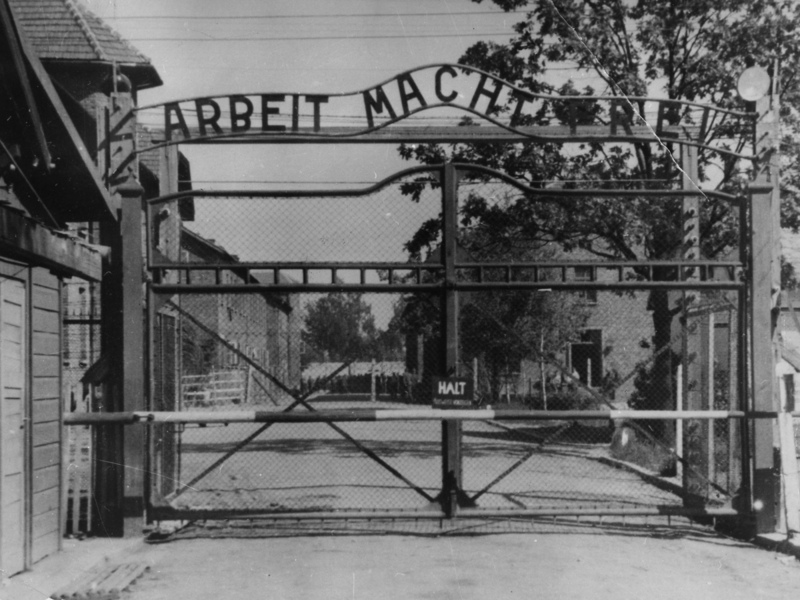 Writing over the gate reads "Arbeit macht frei" (Work Sets You Free). Johann Breyer has admitted to working as a guard at the camp but says he only supervised work parties outside the gates. An 89-year-old man accused of aiding the killing of 216,000 Jews as a Nazi camp guard at the concentration camp located in Auschwitz, Poland, during World War II, has been arrested in Philadelphia. Johann "Hans" Breyer, who immigrated to the U.S. in 1952, was arrested by U.S. authorities Tuesday night. He is being held without bail. "Legal filings unsealed Wednesday in the U.S. indicate the district court in Weiden, Germany, issued a warrant for Breyer's arrest the day before, charging him with 158 counts of complicity in the commission of murder. "Each count represents a trainload of Nazi prisoners from Hungary, Germany and Czechoslovakia who were killed at Auschwitz-Birkenau between May 1944 and October 1944, the documents said." According to the BBC, the U.S. had sought to strip Breyer of his citizenship and deport him in the 1990s, but the drawn-out case failed in 2003 "when a judge ruled he was a natural-born citizen through his mother and was coerced into joining the SS as a minor." The Philadelphia Inquirer quotes Breyer's lawyer, Dennis Boyle, as saying he would fight the request to extradite his client to Germany. "Several times during the hearing he appeared confused about what was happening. "As Assistant U.S. Attorney Andrea Foulkes outlined the case against him, Breyer leaned over to ask his attorney who the woman was. "Breyer is believed to be the oldest person U.S. authorities have accused of links to the atrocities of the Third Reich. "He has previously admitted he worked at the Auschwitz-Birkenau concentration camp in Poland during the war, but told the Associated Press in an interview in 2012 that his duties consisted solely of guarding the outside of a labor camp. "He said he had nothing to do with the slaughter of millions of Jews and others believed to have died inside the gates." The AP reports that Breyer's wife and two grandsons attended Wednesday's hourlong hearing. An extradition hearing is set for August 21.